Earl Greyhound is a power trio rock band from Brooklyn, that has been tagged as the "next big thing" for more than a few years now. Unfortunately and rather strangely they've never quite lived up to expectations in terms of sales or media attention. They give very energetic live shows though and could well be one of the better rock bands no one's ever heard of. 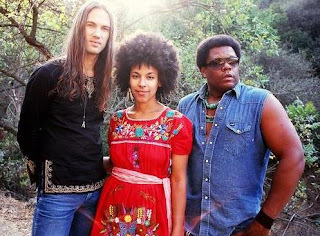 Earl Greyhound consists of Kamara Thomas on vocals and bass, Matt Whyte on vocals and guitar and Ricc Sheridan on drums. Yes, in some respects they are a seventies revivalist rock band but if that hook can propel the Black Crowes and Lenny Kravitz to fame and fortune, why not Earl Greyhound? Anyway they're more than seventies wannabees. 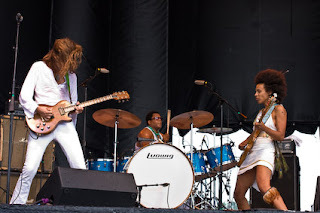 That they are a mostly black band working in what has come to be a mostly white genre may not help matters as well as the fact that they only release an album every four years or so. It's hard to build excitement and following with such a leisurely release schedule. But these days albums are just about dead anyway. Hmm. Anyway the obvious comparisons are to Led Zeppelin (especially because of Thomas' banshee vocals and Sheridan's crushing bass drum work) but actually because of the vocal interplay between Thomas and Whyte, on some cuts they sound more like what The Carpenters would have sounded like if they had turned everything up to 11. The call and response between Thomas and Whyte is one of the best things about this band. Whyte's guitar work may owe some debt to Marc Bolan, Big Star, Jimmy Page and Jimi Hendrix but he's not just an empty copycat. He has his own, still evolving sound. Earl Greyhound only has two official full length releases: 2006's Soft Targets and 2010's Suspicious Package. Their first album was almost entirely very very very loud blues-rock and hard rock while their second album showed some serious expansion both musically and tonally. The second album showed some hints of progressive rock influences (imagine Pink Floyd with better rhythm) as well as samba and Afro-Cuban interests. It also had slightly better sound production. If you are interested you could do worse than to check them out when they come to your town. They tour incessantly. Live version of "Yeah I love You" Live Version of "It's Over"
Joe Tex (1933-1982) was a soul/R&B/funk singer. He was also a member of the Soul Clan, a short lived and mostly informal supergroup of soul and funk singers who generally first made their mark in the sixties. Like James Brown, a sometime romantic and musical rival, Joe Tex was not really a great singer per se but helped to create funk with a great many herky-jerk syncopated songs that straddled the bridge between soul and funk. He talked or rapped over songs as often as he sang over them. He did sing a great many tearjerker ballads but is probably best known for his takes on "Tramp (Papa was too)", "Skinny Legs and all", and especially "I Gotcha". 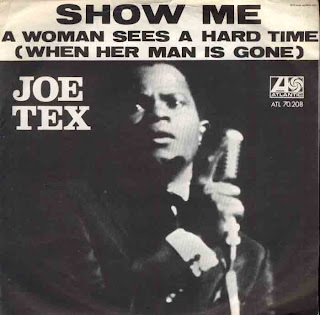 Joe Tex usually used an integrated band in the studio (often the F.A.M.E. Studio) and had more than a passing familiarity with country music. This mix of gospel, blues,soul, country and later funk was a lot of fun. If you go back a few years there are more than a few similarities between country and soul. Like many other singers of his time, he was eclipsed by the rise of disco in the early seventies and after a few game attempts at that style he withdrew from music. He died far too young from a heart attack.